Back in 2012, I was impressed that a movie like Wreck-It Ralph could exist. The amount of licensing agreements needed to bring together so many recognizable characters from famous franchises was a daunting task the likes of which I hadn’t seen since Who Framed Roger Rabbit? (1988). 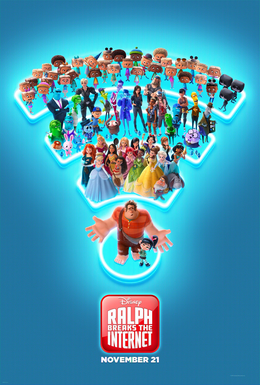 Similarly, the sequel to Wreck-It Ralph, Ralph Breaks the Internet (2018) had the challenge of integrating so many brand names and websites into something that could work as a story without becoming too dated as time marches on. In both cases, I think the balance between brand-name recognition and original content helped to make for an entertaining film. In the lead-up to the release of Ralph Breaks the Internet, I was concerned that it was going to rely heavily on internet memes for its laughs—taking a somewhat similar tack from The Emoji Movie (2017). I also had concerns that this movie would also focus most of its time on the Slaughter Race sub-plot, which would make it almost too similar to its predecessor (which spent perhaps way too much time in the Sugar Rush game, overall). Fortunately, this film again managed to find the right balance, both in references and in sub-plots. While Ralph Breaks the Internet is coy in its self-awareness, I truly loved the segments that poked fun at internet culture (like the jittery movements of player characters in Slaughter Race), as well as the number of Disney tropes flipped on their head. I mean, I’d watch a whole movie with just the Disney Princesses interacting in the way that they did (and if Disney isn’t selling the graphic T-shirts they were wearing in this movie, they’re missing out on a massive amount of potential income). I mean, what movie has a “princess song” about wanting to drive in Slaughter Race? Hilarious. A perfect balance of internet references and self-aware comedy, I give Ralph Breaks the Internet 4.5 stars out of 5.